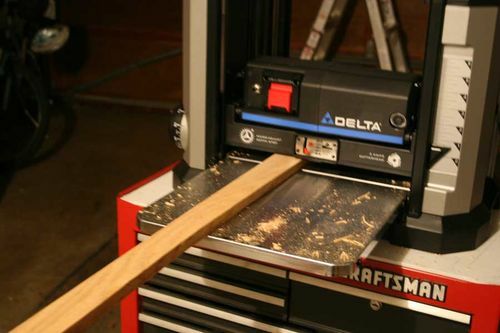 It seems this is the first LJ review of the new Delta 22-590 planer. Delta released this last summer, I believe, and I’ve only found a few reviews by people who’ve actually used the thing. Most of them on the web are just copy-and-paste of someone elses’ review. I wanted to save some money and buy a used planer, and after wasting my time and a lot of gas on a Craigslist deal-gone-bad for a used 22-580, I decided to buy new. This is the 22-590, it’s the update to the 22-580 and it has one big feature that I liked over the older model in that it’s got a three bladed cutter instead of two blades. I’ve read also that the 590 has a new style cutter head lock. I don’t know what the old style was, but looking at mine, I can see two steel bars on each side running top to bottom, and running through what is effectively a caliper in the cutter head, so it’s like a disk brake. You crank the handle on the side and it rotates a bar across the cutter head linking brakes on both sides, cinching them down on the bars locking the cutter head in place. It works really well, I think. This is the first power planer I’ve used since High School, and the one we used was pretty bad so I wasn’t really sure what to expect. After about 15 minutes of setup time, I fired it up and ran a piece of oak trim through it and to my surprise it came out glass-smooth. I made a few more passes, each time across a different part of the cutter for even wear. I’ll make this standard practice in normal use. In the last picture, I could see a couple of very light marks about half way down the wood, and were about 1.5” long by about 1/8” wide. And there was a very light snipe on one end. Both of these defects will come out with a very light sanding which would be done anyway. I didn’t even notice until I held it up to the light and I wasn’t even able to feel either of them. If you have a 22-580 that’s working well for you, this is probably not a worthwhile upgrade, but it certainly would be if you’re using a power planer that’s not giving good consistent results. Not having much to compare it by in recent use, I’m judging it on it’s own merits and I’m really impressed at this point. It really made a nice smooth cut. Now I need a jointer. Thanks for the review of the 22-590. I looked at the 22-580 when I purchased my Dewalt 735, but there were not many reviews to go by. I decided on the Dewalt because of the automatic cutter head lock – so it is good to hear Delta has made that improvement as well. 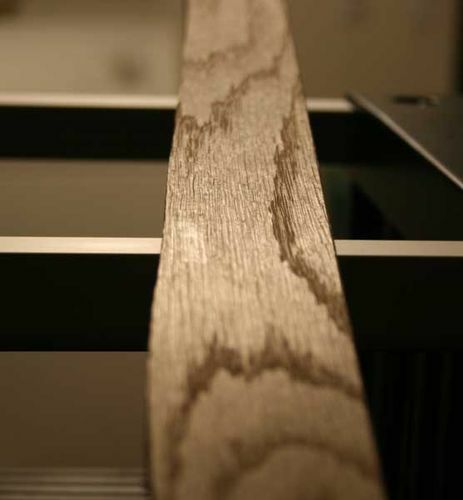 one word of warning about planing very long and thin pieces: it’s sort of the exact opposite of snipe – make sure that when feeding the piece in, the long end sticking out way over the far end of the infeed table is supported and not able to bow downward at all (due to its weight). If it does, it will actually push the workpiece UP closer to the cutterhead (even though it is locked) and your board will be thinner at that point. Likewise, when it comes out the other side, make sure it is supported so that it is not able to flex, otherwise the part under the cutterhead will also be pushed up, etc. Does that make sense? I had this happen to me, and it sucked. It’s not a problem with the planer per se, just a problem with having very long pieces and a short table length. Nice review, I was recently on the market for a planer but I settled on the Steel City helical portable planer. Congratulations on your new planer! Congratulations on your new planer, I know you will enjoy it. A cutter lock on your machine will usually minimize snipe. Also tlting the end of the board up just a hair at the end of the run will decrease snipe. But really most lunch box machines produce snipe. The best trick I’ve found is to include a couple of inches in the length of the board, if feasible, and cut off the snipe. I don’t think sanding the snipe away will work to your liking. Enjoy. I have the old school DELTA ShopMaster TP305 and love it for what it is. 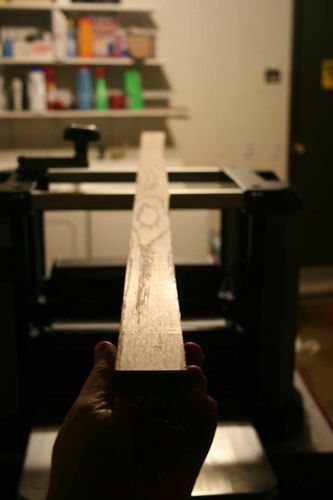 I have planed thousands of board feet (mostly cedar) on one side of the blades. I am just about ready to flip the blades over after 3 years of owning it. The only complaint I have is that mine snipes like crazy but I can work around 2 inches of snipe on my boards. I hope your planer gives you as many years of valuable service (being a few models above mine) as mine has. (Dedvw) I too have the Delta TP305, And also love it. The power that little thing has is amazing. Also hauling that planer is no fun…. Nice buy, Like Alway’s Delta is in the top. I just bought the 22-590. I removed the blade guard cleaned the blades added wax and put the dust chute on set up time less than 30 minutes. I made a test run on red oak it was quiet for a planer and no snipe out of the box. My experience was great five stars for the machine.